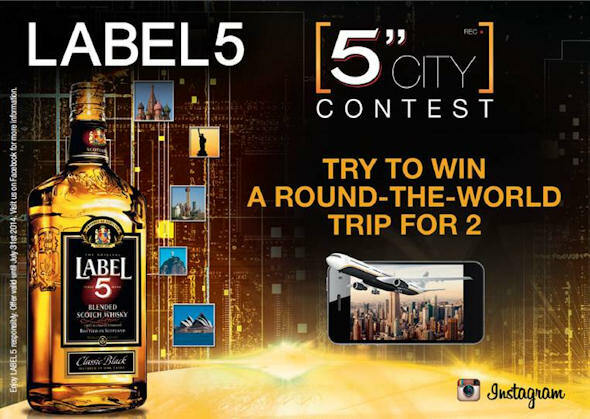 Leading Scotch Whisky Brand LABEL 5, is launching on the 10th of June an amazing competition through its Facebook pages, the 5” City contest, which invites its worldwide fans to take a 5-second Instagram video of their favourite city, to get a chance to win a round-the-world trip for 2! After the Catchthe5 contest and the WorldmiXperience web series, LABEL 5 continues to successfully use digital marketing tools to reinforce the brand original content and to celebrate the World Mix Spirit! The contest gives the opportunity to engage the fans by inviting them to share through Instagram their vision of their city in a 5-second video. The campaign, built on the legendary number of the brand, encourages the participants to showcase their creativity in homemade short videos : they only have 5-second to capture the beauty and magic of their favorite city . The 2-month competition is running from June, and will run in many countries across the world. The participant who submit the video that receives the highest number of votes will have a chance to win a round-the-world trip for 2. To participate, it’s very easy! - 1st: You need to become a fan of the LABEL 5 Facebook Page and register for the contest. - 3rd: Finally, invite your friends to vote for your video. Remember to enjoy LABEL 5 responsibly.